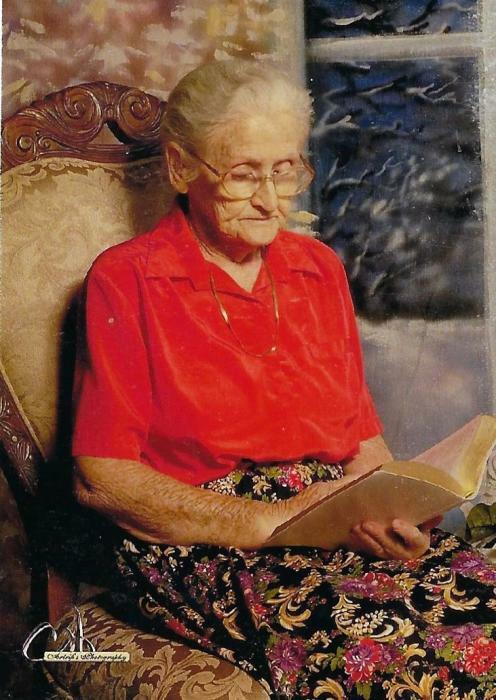 Dorsie Patton, age 101, of Eastern, KY, passed away Saturday, April 13, 2019 at her residence. She was born November 12, 1917 in Mousie, KY, a daughter of the late Ballard and Ora Wicker Hicks. She was a member of the Brandy Keg Freewill Baptist Church and a homemaker. She is survived by three daughters; Beulah Baldridge, Eastern, KY, Patricia (William) Price, Wawaka, IN and Debora (Rex) Cecil, David, KY, one step son; Gary Patton, Okemos, MI, five step daughters; Sally Lou Bailey, Hurst, TX, Cleffie Wooten, Yipsilanti, MI, Pauline Layne, Martin, KY, Martha Collins, Milan, MI and Barbara Goss, Fenton, MI, a host of grandchildren, great grandchildren and great-great grandchildren also survive. In addition to her parents she was preceded in death by her first husband; Allen Hicks, second husband; Miles F. Patton, two step sons; Joe and James Patton, two step daughters; Patsy Davis and Marie Hall, three sisters; Flossie Wicker, Beulah Nickles and Lucy Moore and three brothers; Huey Hicks, Curtis Hicks and Ballard Hicks Jr.
Funeral service will be conducted Wednesday, April 17, 2019 at 1:00 p.m. in the Hall Funeral Home Chapel with Steve Slone, Roger Music and other Freewill Baptist Ministers officiating. Burial will follow in the Turner/Patton Family Cemetery, Eastern, KY, visitation is from 6 until 9 p.m. Monday and all day until 9 p.m. Tuesday at the funeral home, under the professional and dignified care of the Hall Funeral Home, Martin, Kentucky. Serving as pallbearers will be; Bobby Baldridge, Jason Patton, Miles Price, Greg Skeans, Manny Barrozo, Chris Harlan, Austin Parshall and Jason Hoover.